While Independence Day may be behind us, that doesn’t mean we have to put our patriotism on the shelf until next year. 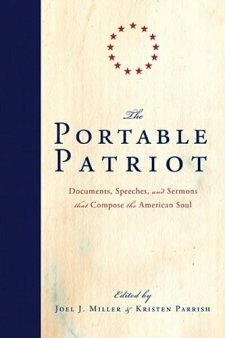 A recent e-mail I received from a PR agent tipped me off to a new book from Thomas Nelson Publishers called The Portable Patriot: Documents, Speeches, and Sermons That Compose the American Soul and edited by Joel J. Miller and Kristen Parrish. It is one I recommend highly. If you, like me, are fascinated by stories of our country’s origins, especially when they come straight from those who lived them, then this is definitely a book you’ll want to consider reading. From the first settlers in the early 1600s to our country’s founding, the stories recounted here are remarkable. I found the book thought-provoking and a definite page-turner, especially when engaged in stories like the one early in the book from late 1600s settler Mary Rowlandson as she harrowingly recounts having been taken captive – a three-month ordeal – by Native Americans and the many losses suffered along the way. Still, her faith gave her the strength to push on in the face of innumerable obstacles. The Portable Patriot is my own “little library of foundational documents” and a welcome addition to my bookshelf.